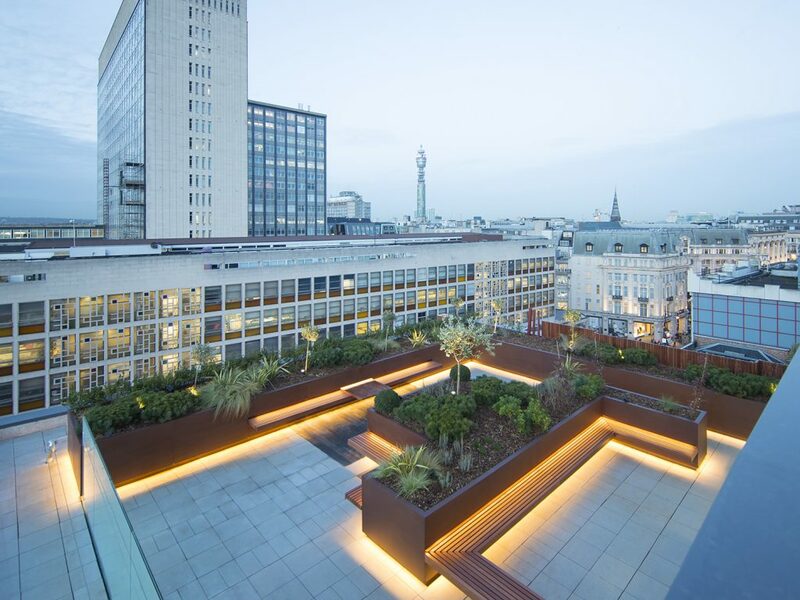 Europlanters were the contractor of choice on a new development project at the corner of Hanover Square and Oxford Street London, that connects two properties previously separated by an internal courtyard. McLaren construction were appointed by Aviva Life & Pensions to completely demolish the existing office and retail buildings at 287 Oxford Street and 11-12 Hanover Square in Westminster and to construct a new eight storey building, producing a much larger space comprising of retail space and commercial offices. The new £2.4M development, built over 8 floors including the basement, was designed by Campbell Architects. On the sixth floor, where the building steps away from Oxford Street, the space was developed into a large roof terrace with views across the city skyline and overlooking the hustle and bustle of the shoppers below. A second smaller terrace sitting on the seventh floor looks out over the larger green roof terrace. 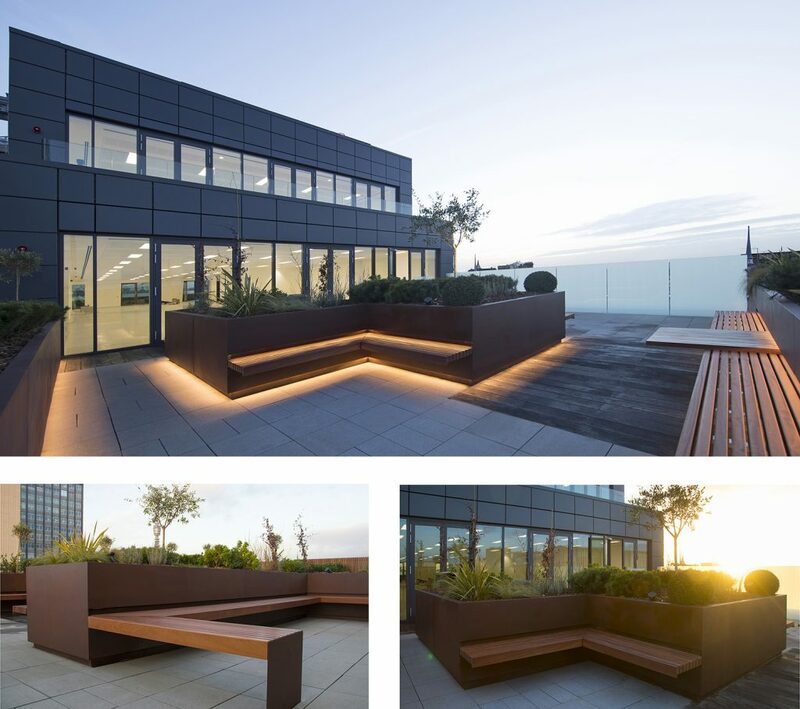 Europlanters were involved in the design and manufacture of the large terrace to create a secluded garden area for clients using the office space. The design included Corten clad GRP planters with Sapele timber floating seats and tables. LED lighting was added to create a relaxing ambiance and Sapele timber screening to frame the view of the city skyline. The project comprised of 21 metres of seating made from Sapele timber. An ‘L’ shaped planter 11.4 Metres long, with a further 9.2 metres of planter down the right hand side. A large planting bed in the centre of the roof terrace was created with floating seating arranged to create three private spaces. The planter which is 3.2 metres long was made from GRP panelling to create one very large planter. 7 metres of Sapele timber screening was then used as a wind-break and to frame the skyline. LED lighting was also fitted to the planters and seating to light up the garden, creating a relaxed atmosphere away from the sounds of the city below. The containers were planted using a wide selection of shrubs and trees to complement the surroundings and create a framed view of the skyline.